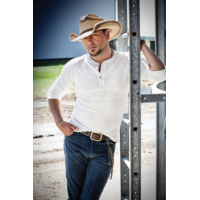 Jason Aldine Williams (born February 28, 1977 in Macon, Georgia) is an American country music singer, known professionally as Jason Aldean. Since 2005, Aldean has recorded for Broken Bow Records, an independent record label for which he has released four albums and twelve singles. His 2005 self-titled debut and 2009 album Wide Open are both certified platinum by the Recording Industry Association of America (RIAA), while 2007's Relentless is certified gold. Of his singles, four have reached the number one position on the Hot Country Songs charts: "Why", "She's Country", "Big Green Tractor" and "The Truth", and six more have reached top ten on the same chart.